O Creator of everything and of all creation, O all-wise Creator and Governor and Foreseer, the Provider of every earthly and heavenly good, and the Distributer of gifts. O only immortal King, You Who feeds our bodies with the fruits of the earth, and strengthens our souls by Your secret and invisible presence. You Who grants to Your sons and friends the good things of Your eternal Kingdom, and Who reveals the inscrutable mysteries of Your will to Your Saints from all ages, and the richness of Your love supplies all through the inheritance of eternal gifts. 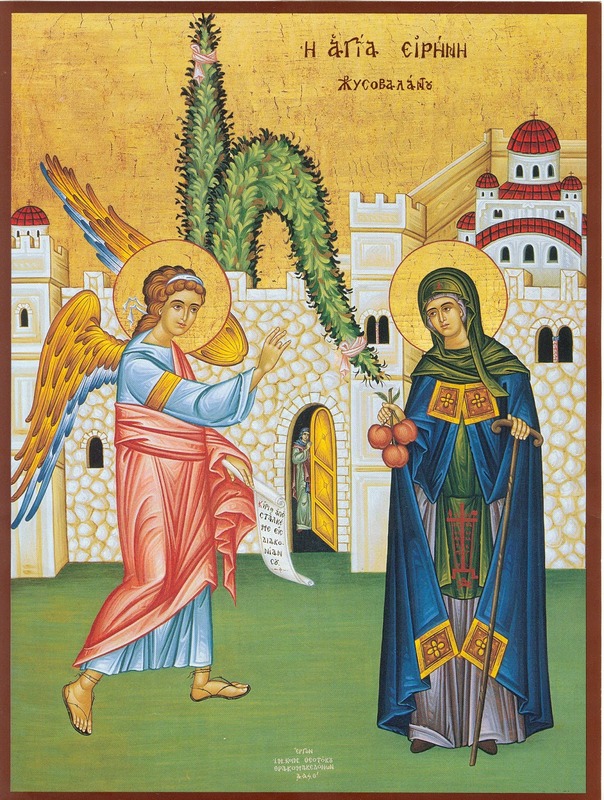 You Who the Venerable Irene pleased in the Monastery of Chrysovalantou through perfect asceticism, granting her the knowledge of heavenly mysteries and the promise of Your Kingdom to come. Who granted her three apples from Paradise, through Your bosom-friend and theologian John, as a foretaste of joy that surpasses this world, which filled her with unspeakable fragrance and rejoicing, as a witness to the Divine Trinity which had dwelt in her. Who taught her Your perfect desires and showed her life to be a fragrance of praise and a holy offering. Do You therefore now, O Merciful Lord Who loves mankind, the spring of blessings and grace, Who sanctifies those who believe in You, and ever heals those who hasten to You, receiving everything that we offer to You with goodness, receive also these apples, and bless them through the riches of Your goodness, and grant to those who partake of them the holiness of Your blessing. May these be for healing of soul and body, for this authority belongs to You. Dissolve the bonds of barrenness for all those who partake of these apples, and richly grant them children as the grains of sand. Heal the wounds of the soul, and the pains of the flesh for those who seek Your help, through the reception of these apples. For we count your intercessions for protection, [O Saint]. Send down the peace from above on all those who honor you, as the namesake of peace, and the faithful healer of God, the Prince of Peace. 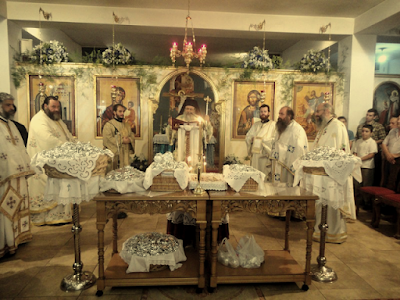 Grant to us to pass through life without reproach, that we be made worthy to partake of the food of Paradise, while we partake of the fruit of grace secretly, and are filled with sanctification and partake of salvation. Confirm in us the fragrance of grace, which we lost through tasting of the apples in Eden. Renew within us, through your intercessions, the Holy Spirit, to strengthen us in all things. Strengthen us in the good fight, and with Your radiant [Guardian] Angel may we complete the road of the faith. That we might, together with the Angels of God, give glory, and offer Him worship, worshiping the unbegotten Father, giving glory together with the begotten Son, and honoring the All-holy Spirit: One Trinity and Godhead, to Whom belong glory and worship unto the ages. Amen. 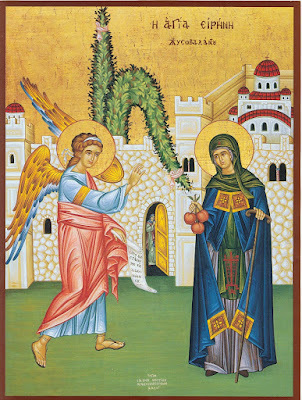 * Abbess Isidora (Xekouki) is a noted theologian and hymnographer, and abbess of the Monastery of Saint Hierotheos in Megara.